Oct. 2, 2018, 4:34 p.m.
By Laura Hazard Owen @laurahazardowen Oct. 2, 2018, 4:34 p.m.
You could certainly read The New York Times’ massive investigation (14,128 words, by my count) into how Trump’s “self-made” fortune is not only not self-made but also involves tax fraud. But the Times knows that not everybody is going to do that. 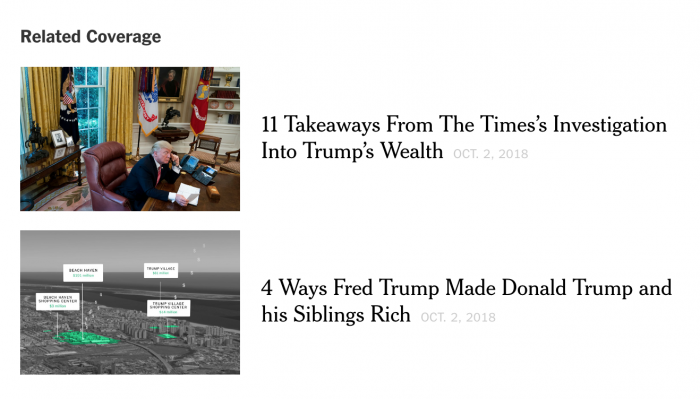 So on Tuesday afternoon, at the same time that it published the investigation that was a year in the making, it also aggregated itself — publishing “11 takeaways from the Times’s investigation into Trump’s wealth.” The TL;DR version is by the same authors as the full investigation (Russ Buettner, Susanne Craig, and David Barstow), and, at over 2,500 words, it’s pretty much a longread of its own. There’s also this much shorter interactive version, with audio and video. The Times has other plans to promote the story as well. On Tuesday afternoon, its reporters were tweet-threading the juiciest chunks, and the Times’ email alert included much of the story’s text. Pay close attention to All County Building Supply. It’s the most overt fraud we found, and Donald Trump and his siblings were shareholders. Its goal: make cash gifts from Fred Trump look like legit biz transactions. POSTED Oct. 2, 2018, 4:34 p.m.
Owen, Laura Hazard. "Why The New York Times TL;DR’d its own 14,218-word Trump investigation." Nieman Journalism Lab. Nieman Foundation for Journalism at Harvard, 2 Oct. 2018. Web. 19 Apr. 2019. Owen, Laura Hazard. "Why The New York Times TL;DR’d its own 14,218-word Trump investigation." Nieman Journalism Lab. Last modified October 2, 2018. Accessed April 19, 2019. https://www.niemanlab.org/2018/10/why-the-new-york-times-tldrd-its-own-13000-word-trump-investigation/.